DeSilva+Phillips client Vision Critical, a global leader in customer intelligence software and support, announced it has reached an agreement to spin off its North American Research Consulting division with a sale to MARU Group. 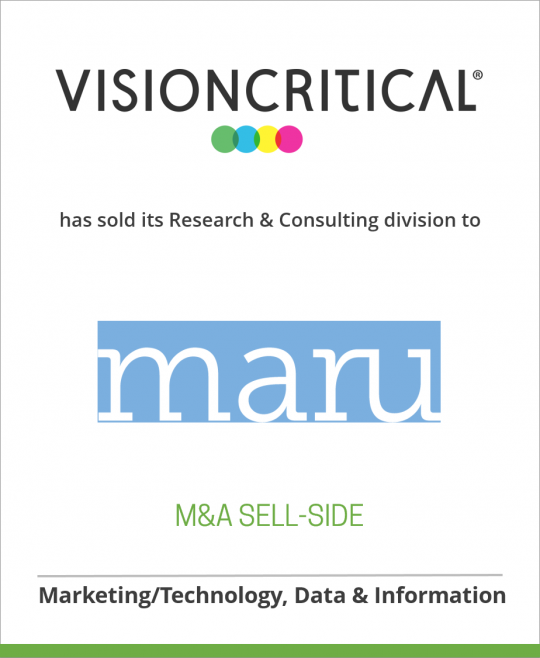 The new business will operate as a standalone entity within MARU Group as MARU/VCR&C, under the leadership of the current Vision Critical research consulting executive team. The transaction enables Vision Critical to focus exclusively on driving innovation in the fast-growing ecosystem of customer intelligence technology, expanding how companies listen, learn, and distribute customer insight throughout the enterprise. Vision Critical combines a proprietary, cloud-based software platform with a support team that leads the industry in delivering insight from large, highly engaged communities.The integrated offer empowers companies with the ongoing intelligence they need to drive more confident business decisions. Following the transaction, Vision Critical will work in close collaboration with MARU/VCR&C via a value-added reseller and strategic partner agreement. As independent companies, each will be positioned to excel with their unique yet complementary mandates, united by a shared objective of continuing to deliver world-class customer intelligence to the world’s leading brands. Hundreds of high-performance organizations use Vision Critical’s technology. Follow Vision Critical on Twitter at https://twitter.com/visioncritical. “Vision Critical” and “Sparq” are trademarks of Vision Critical Communications Inc. Other product or service names mentioned herein may be trademarks of their respective owners.